America’s longest running Gran Fondo represents Italian Cycling and Culture on the West Coast at its finest! 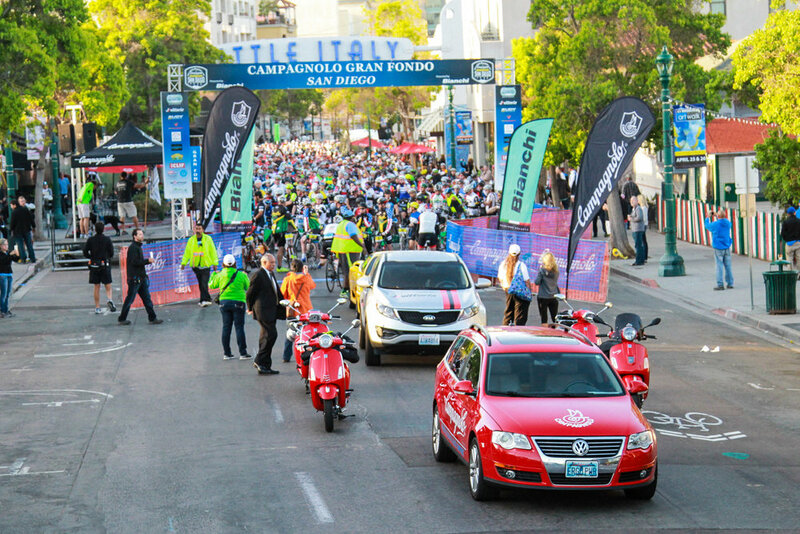 San Diego, CA – SoCal’s early season Italian Epic is back on Saturday April 7, 2019, starting under the iconic “Little Italy” sign in downtown San Diego. 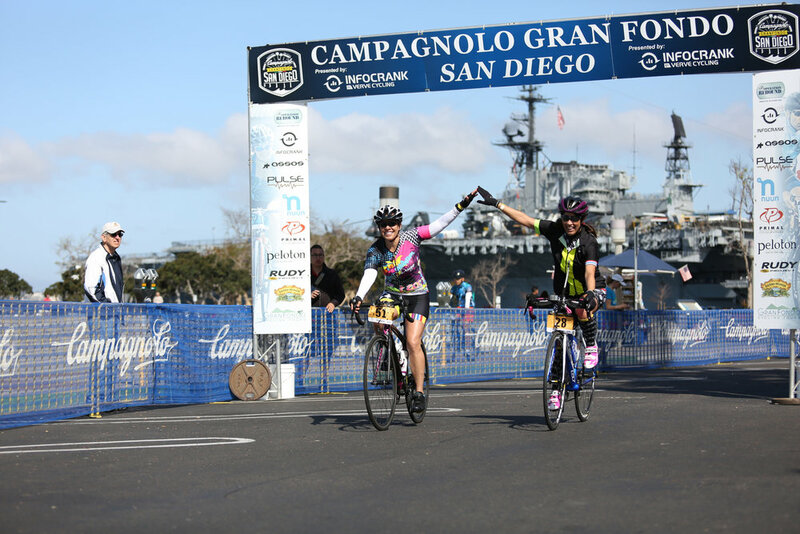 The Campagnolo Gran Fondo San Diego is one of North America’s Top Gran Fondo’s, attracting cyclists from over 32 states and over 20 countries worldwide. While the ride grows in popularity each year, it maintains its charming, friendly, and intimate atmosphere. Started in 2009, its North America’s longest running Gran Fondo. Italy’s finest bicycle and component manufacturer Campagnolo, has been title sponsor for seven years. Four routes, allow cyclists of ALL abilities to enjoy this truly authentic Italian experience. The 20-mile Fun Fondo brings riders along San Diego’s picturesque Big Bay, while the 32-mile Piccolo Fondo adds more of a challenge, heading inland for 900’ of climbing. Hardier riders will enjoy the 60-mile Medio Fondo with 1,500’ of climbing, and the 100-mile Gran Fondo, includes 7,000’ of climbing and a timed King/Queen of the Mountain competition on the climb of Japatul Road! In true Italian Flair, the huge peloton will be led out by an impressive procession of the finest Ferrari’s, while world-class Campy mechanics provide on-course assistance, as you experience America’s Finest City and its surrounding mountains, beaches, deserts, and lakes. You’ll benefit from up to five fully-stocked aid stations too. Your ride culminates on San Diego’s famous waterfront with a finisher’s medal, a free massage, beer garden, and a four-course Italian feast! San Diego shares Italy's temperate Mediterranean climate, so you can look forward to cycling in ideal temperatures ranging from 60 and 70 degrees Fahrenheit! A true Italian Gran Fondo is meant to make an everyday rider feel like a fully supported professional rider, and the Campagnolo Gran Fondo San Diego does so with true Italian panache. Make sure you add America’s “Original Gran Fondo” to your Bucket List! Registration is open and early entry is advised to secure a place. Register now and save, prices go up February 22nd, 2019! The Campagnolo Gran Fondo San Diego is proud to support Challenged Athletes Foundation's® (CAF) Operation Rebound® through Life Sports Foundation. Challenged Athletes Foundation's® (CAF) Operation Rebound® program is the premier sports and fitness program for American military personnel, veterans and first responders with permanent physical disabilities. Although fundraising is not required it is greatly encouraged. The Ride organizers show their thankfulness by providing a free ride entry and Jersey to any rider raising $600 or more. A Gran Fondo is meant to make an everyday rider feel like a fully supported professional rider, and the Campagnolo Gran Fondo San Diego does so with true Italian panache. Founded in 2009, the event is now in its tenth consecutive year and the Italian bicycle component manufacturer Campagnolo has been its title sponsor since 2013. 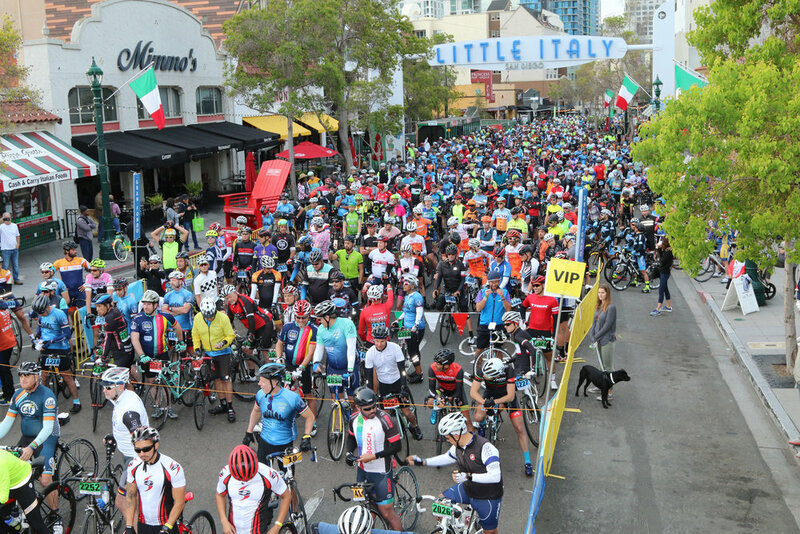 Riders line up under the iconic “Little Italy” sign in downtown San Diego, where professional announcers call up cycling celebrities and an impressive procession of Ferraris leads out the peloton. World-class Campy mechanics provide on-course assistance and the event culminates on San Diego’s waterfront with finisher medals, free massage, beer garden, and a four-course Italian feast. San Diego, dubbed ‘America’s Finest City’, is a world-renowned cycling destination, and home to mountains, beaches, deserts, and lakes. The Campagnolo GranFondo San Diego, the longest running GranFondo in America, showcases both its natural and urban wonders. Some may ask why a GranFondo would offer shorter ride options, organizers say, “The GranFondo Experience should be fun for everyone. We want to grow the cycling community by encouraging the love of cycling and encouraging everyone to get out there and ride. We’ve had many riders start out at lower mileages and come back year after year with the goal of conquering one of the longer rides. Many experiencing the GranFondo for the first time are amazed by the fun and excitement of the Little Italy start and by the sheer size, fun and fanfare of the GranFondo Finish line party.” This year the Cycling, Health and Wellness Expo is featuring speakers from local cycling advocation groups, clubs and supported charities. San Diego shares Italy's temperate Mediterranean climate, and riders can look forward to cycling in ideal temperatures ranging from 60 and 70 degrees Fahrenheit on event day. While the ride grows in popularity each year, it maintains a charming, friendly, and intimate personality. The Campagnolo Gran Fondo San Diego is proud to support Challenged Athletes Foundation's® (CAF) Operation Rebound® through Life Sports Foundation. Challenged Athletes Foundation's® (CAF) Operation Rebound® program is the premier sports and fitness program for American military personnel, veterans and first responders with permanent physical disabilities. Although fundraising is not required it is greatly encouraged. The Ride organizers show their thankfulness by providing a free ride entry and Jersey to any rider raising $600 or more.